What began as a novel and tantalizing idea finally turned to reality. After weeks of anticipation and hard work; R.E.A.L Schools, Cheras Campus officially launched its inaugural Food Technology course and brand new Bella Café on 26 August 2016. 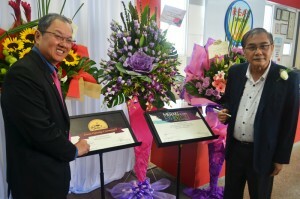 Present at the launch were Group President, Mr. Ee Ching Wah and Dr. Sim Quan Seng, Chairman of R.E.A.L Education Group. Food Technology is the latest course to be incorporated into the campus’ innovative Art & Design Programme which also offers seven other modules; namely Photography & Digital Media, Music, Fashion Design, Graphic & Multimedia, Fine Art, Performing Arts Drama and Dance. These electives, which are catered to secondary students only, are in line with R.E.A.L Schools’ continuous efforts to offer unique educational experiences with lifelong practical benefits. The inaugural initiative, arguably the first among private and international schools, encompasses more than just food preparation. Students stand to learn the finer details of food products; covering areas such as quality control, product management and possibly even new product development. They are also set to acquire insightful knowledge of raw materials and proper ways of handling and packaging food in order to offer customers something safe, convenient and tasty. Adding further cause for celebration was the eagerly-awaited opening of Bella Café. 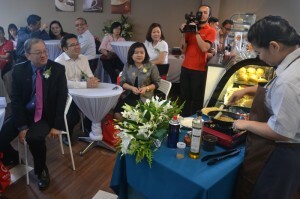 In conjunction with the launch, guests were treated to a ‘Live Food Demo’ by students and a specially-invited hotel chef. Managing the café would enable students to apply their knowledge and skills into real-life situations. “Serving more than just food and beverages, I am pleased to note that this student-run café also serves as an extension of the Food Technology course. As the first of its kind at R.E.A.L Schools, both course and café provide priceless platforms and opportunities for students to broaden their knowledge and understanding of the more technical aspects of food; from creation to consumption,” said Mr. Ee. “The school has even roped in a guest chef from a 5-star hotel to come in and share valuable industry experience and expertise, whilst cooking up a sumptuous spread. 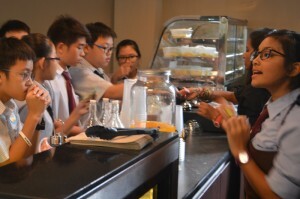 Ever since the café began operations, the response from both students and parents alike has been extremely encouraging. They have been queuing up daily to buy the various delicious treats on offer,” said Ms. S.P. Lee, General Manager of R.E.A.L Schools, Cheras Campus. “This Food Technology course would also go a long way in teaching our students on how to run a business. The practical know-how and experience gained from being bona fide café operators could prove invaluable in their future endeavours. Among other things, they will be exposed to a range of management skills and areas like customer service,” added Mr. Ee. The day also witnessed the culmination of the week-long ‘Meraki of Arts Exhibition’. The new name for this year’s edition, ‘Meraki’, was derived from a Greek word which means ‘the soul, creativity or love that is put into something’ or ‘the essence of yourself that is put into your work’. It is a fitting tribute to the stunning array of paintings and exhibits on show. 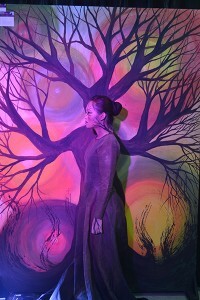 The annual exhibition features breathtaking works of art by 30 Cheras Campus students and several invited professional artists. The event is not only a superb showcase of artistic talents but also a testament to the school’s successful Art & Design programme. As per tradition, all paintings were put up for sale and part of the proceeds collected would be channeled to charity. It is part and parcel of R.E.A.L education to extend learning beyond books and classrooms. Students are always encouraged to be actively involved and engaged in the learning process. These pioneering projects are set to add another dimension to the school; not only in terms of its facilities but the educational value it will offer students for years to come. After all, education at R.E.A.L Schools is more than just learning. It is an experience. The post Cafe, Food and Fine Art Come to Fruition in Cheras appeared first on best international schools in malaysia.